We are delighted to introduce David and Lucy Rees as the newest members of the Barn Store group opening their shiny new self storage facility at Hardwick Farm, Pembridge. 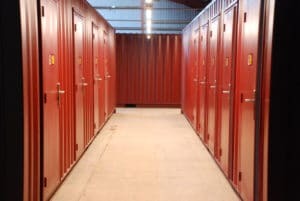 Their recently upgraded 11,000 sq ft farm building has been kitted out with brand new shipping containers, the latest CCTV and alarm systems, large roller shutter doors and electronic fob entry system giving customers the easy 24/7 access they have come to expect from all of our self storage facilities at Barn Store. To celebrate their new venture David and Lucy are offering a 20% introductory discount to all new customers moving in before March 2019. This discount can be used in conjunction with our two year fixed price guarantee meaning we will never charge you more for your unit for at least two years of storing with us. No hidden fees or price increases from any of the Barn Store sites! Just honest, upfront pricing as standard. Fill in the enquiry form below and book a visit to Barn Store Pembridge today. Visit their ‘About‘ page to read more on the Rees’ story.